Please join us Saturday, September 8th, to work on the Boulder Gulch Trail. We will meet at 9 am Pedal The Peaks, 906 Greene Street. Be prepared to do a fair amount of hiking through rugged terrain. We will provide tools, but if you have trail tools that you are willing to lend to the effort, please bring them. Cold refreshments and pizza party to follow at Pedal The Peaks. Questions? Email us at info@silvertonsingletracksociety.org. Silverton Singletrack Society is building a comprehensive database of existing trails in San Juan County. If you would like to help in this effort, simply bike or hike a trail in San Juan County and email the GPS track to trails@silvertonsingletracksociety.org. You do not need a dedicated GPS unit to do this, all you need is a smartphone with a GPS app. Our long term goal is to develop the world's most awesome network of trails right here in Silverton. The first step in that process is going to be to catalog what is already here. We will eventually use this information to create a map of all the singletrack in San Juan County and make it available to the public. There is a possibility that we will be able to credit you for your work. If you would prefer to remain anonymous, please let us know in your email. The purpose of this project is simply to map the trails that currently exist, not to improve them or build new ones. That comes later, once we have obtained permission from the land managers or private land owners. If you have any good photos from your ride or hike, feel free to send us those as well. You can also help us by simply tagging any photos from San Juan County trails with #SilvertonSingletrack on social media. We also encourage you to submit trails to MTB Project. For details on how to do that, go here. We are now an IMBA Chapter. As of September 16 2014, when you join Silverton Singletrack Society, you also become a member of IMBA. If you joined before that, you are now also a member of IMBA. Thanks to everyone who came out for our kickoff party. We signed up over 40 new members and raised over $1300 from memberships and donations. Thanks to Avalanche Brewing, Ska Brewing, Smith Optics, Silverton Ski & Bike for awesome raffle prizes and tasty beer! 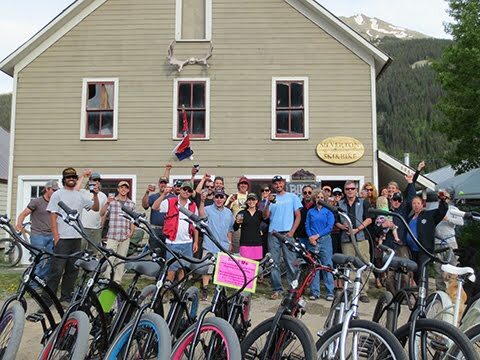 Join us for Silverton Singletrack Society's kickoff party at Silverton Ski & Bike, Saturday June 21st at 3 pm. We'll be running a membership drive to raise funds for our trail building and maintenance efforts and recruiting volunteers for trail work days. All members (inluding those of you who have already joined) will be entered into a raffle with prizes from Smith Optics, Silverton Ski & Bike, Avalanche Brewing, Ska Brewing and others. Free beer and food from Avalanche Brewing and Ska Brewing! If you can't make the party, you can join any time here.